I can't believe TL and I have been married almost a year (September 5th). What an amazing, busy, roller-coaster of a year. We both cannot wait! 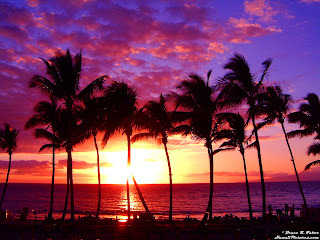 I love the beautiful Hawaiian Islands. In my mind, there is no place that has the feeling it does... it even smells good. We are so excited to relax, spend time together, and have absolutely nothing on the agenda. It's also a great time for us to reflect on the past year (how quickly it has passed) and talk about our plans for the future. I haven't been out in the sun much this summer - so I am also excited to tan. I've had to make a few small purchases at the Victoria's Secret swim sale... can't wait to relax with my toes in the sand! We are staying in Kaanapali. Hope you are having an amazing Saturday! It looks so beautiful, wish I could be there!! Sounds so amazing. I hope you two have the best time and leave feeling totally refreshed! I remember when you were getting married and watching all yer posts! I'm glad you've had a great year!! Isn't it exciting to see what next year will bring?!! It's soo crazy it's already been a year! It's funny how time flies and how fast everyone's lives change. SO SO SO FUN! We'll be there in October!! Tell Maui we cant wait to meet it! ha! :) I cant wait to stalk your photos! We're staying in Wailea and I'm so excited to go, I can't even stand it! Any and all advice welcome! Have a blast, girl! :) YAY! I love Kaanapali, too! It's the best place to relax with someone you love. And you're right...Maui does smell good!! Have a great time!! Happy 1st Anniversary!! WOW! A year already! Time flies! Have a blast! Hawaii really is just so magical! jealous jealous jealous!! take me with you!! yes on your anniversary trip :) go to napali. it's beautiful! Have fun :) Hawaii is AMAZING! Sounds amazing!!! Have fun, and happy anniversary!!! Check out your fabulous feature; such a beautiful bride!